Traffic on the Major Deegan Expressway in the Bronx ground nearly to a halt on Tuesday afternoon because of a mysterious brunette running wild through the cars. It is unclear where she came from, or how she ended up on the expressway. Also, she is a cow. According to CBS New York, the brunette was spotted running “southbound between the Cross Bronx Expressway and Yankee Stadium exits shortly before noon.” Half an hour later, animal control and law enforcement officers arrived on the scene and captured her, tethering her to a light pole on the highway median before tranquilizing her. She is reportedly being taken to an Animal Care and Control facility in Manhattan, and will then be transported to her new home, the Skylands Sanctuary in New Jersey. This is far from the first time a cow has gotten loose and tried to make its way in the city. 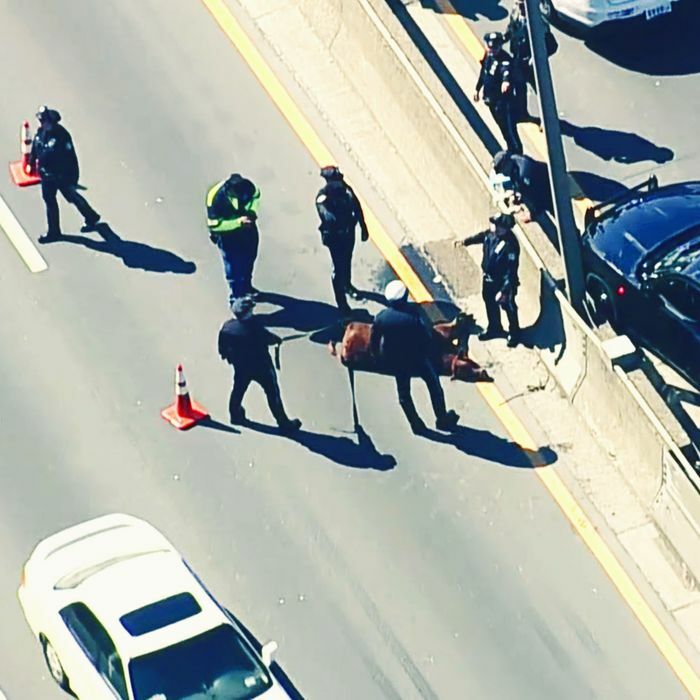 As NBC New York notes, in December, an escaped cow spent an hour wandering around a highway near Patterson, New Jersey. In October, a young escaped bull was caught running around a soccer field in Prospect Park. And in September, an escaped cow in Queens rammed into a police car before it was tranquilized and captured. Cows aren’t the only livestock to take to New York’s streets recently. Just last week, a lamb was seen running loose on the Gowanus Expressway during rush hour. Perhaps, like the chickens, the cows will soon get fed up by their dismal living conditions, and fight back. It’s Happening. The Chickens Are Fighting Back.